It is hard to say what I have missed the most since finding out that I am intolerant to wheat, gluten, dairy, eggs and three different types of nuts. Bread is pretty high up on the list though. Before cutting it out, I mostly ate sourdough bread – preferably dark rye sourdough bread. Just seeing such bread in a good bread shop makes me drool. But guess what, I have found a way to make super-tasty gluten-free bread with quinoa flakes, seeds and nuts. 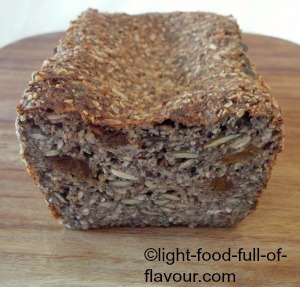 It pretty much tastes like the rye bread I love - I am hooked! It requires a fair bit of resting time before being baked in the oven but it is super-easy to make. All you have to do to make this gluten-free bread is mix all the ingredients together and pour the mix into a bread-tin. I have used a recipe from Ella Woodward but I have made some changes to it – including resting time before baking and baking method. There is no yeast in this bread and the only flour I am using is the flour you get from blending quinoa flakes, walnuts and pumpkin seeds together. To this you add sunflower seeds, chia seeds and psyllium husks. The psyllium husks (a source of dietary fibre) are vital to this gluten-free bread recipe as the husks bind the mixture and make the bread less crumbly. You will find it, and all the other ingredients, in health food shops and sometimes in well-stocked supermarkets. I have chosen to add five chopped, organic dried apricots to my bread. The sugar content in dried fruit is high, but as I put in so few, it won’t cause much damage. Try buying organic ones if you can. Naturally dried apricots have a dark “brownish” colour. As producers are afraid that this will turn off buyers they treat the dried apricots with sulphur dioxide to give them the colour apricots have when fresh. I use a bread-tin which is 22cm (9 inches) long x 11cm (4¼ inches) wide and 6cm (2½ inches) deep – but it might be better to use a larger one (see below). 1. Cover the baking tin with baking parchment. Place the walnuts, quinoa flakes and 100g, 3½oz, 1 cup of the pumpkin seeds into a food processor and blend for a couple of minutes until you have a fine flour. 2. Add this to a bowl together with the remaining pumpkin seeds, sunflower seeds, psyllium husk, chia seeds, salt and chopped apricots. Mix together before adding the water and mixing everything together thoroughly. 3. Pour the mixture into the baking tin and smooth out the top with the back of a spoon. Let it sit out on a counter for either a day, or overnight, before baking. 4. Pre-heat the oven to 180C/Fan 160C/350F/gas mark 4. Place the baking tin in the oven and bake for 40 minutes. Remove the bread from the tin and place it upside down (without the baking parchment) directly onto the oven rack and bake for further 20-30 minutes. If you pierce the bread with a sharp knife, the knife should ideally be dry when you pull it out. Now I am going to confess that I have never achieved this even though I have baked the bread for even longer most times. This might be due to the baking tin I use, which makes quite a high bread loaf. It doesn’t matter to me, as this bread is not made with ordinary flour and yeast – I toast each slice anyway. You could try using a larger baking tin than I do – it might be that making the bread less high will dry it out better.